Always wanted the hardware but this will do. This does the job very well once you get familiar with the controls. The Cyclosonic is not for everyone or everything. But it is a lot of fun to find uses for. I found that when critical listening to mixes, I would reach for it when the mix needed a little movement on backing vocals, rhythmically or layered with synth parts. If you are on a tight budget & looking to get really useful plug ins, this would not be where I spend my money. 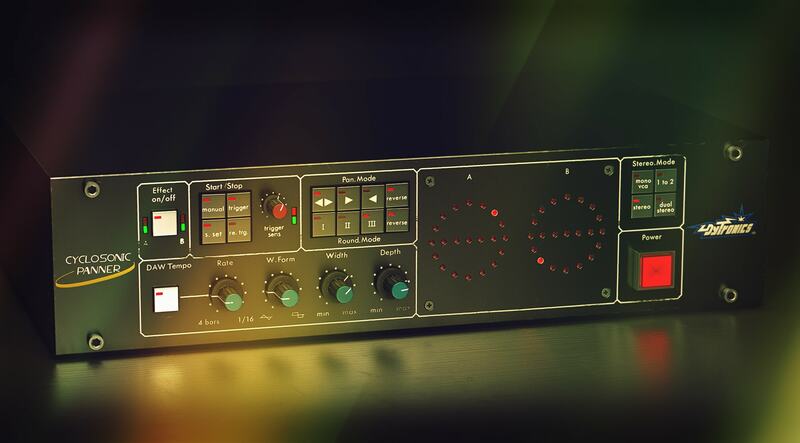 This is now my number one UA plugin purchase regret.. So much so I am actually going to ask to see if I can swap for another plugin + whatever cost difference. I should have demoed it properly.. The issue is, that the time is from 30 seconds to 0.1 second, but the display field shows that in *percentage*, which is useless.. Rather than the actual time.. If it showed the actual time, one could set something suitable by using a tempo calculator.. The problem with the Sync option is that I saw 4 bars in the picture.. and presumed i could do 1/2/3/4 bars.. but it goes from one to 4 only.. and then no higher..So you can sync an auto pan at 1 bar or 4 but not in between, and everything else is under a bar (more useful for rhythmic effects/stutters etc). Softube had to be stubborn on this one instead of giving a full complement of tempo options.. They just had to follow the hardware.. This is exactly why we buy plugins, to get the good hardware sound but free ourselves of limitations.. Anyway.. It does more than pan, which is why i gave it an extra star.. I will never use it for auto panning, nor rhythmic effects as I already have much, much better plugins for the latter, but at least it's not only a one trick pony. Now.. I recently bought WAVES brauer motion for $29 on sale.. THAT is a pan plugin.. and i am not a huge waves fan.. But that was a bargain, and makes this softube plugin look like a joke.. I mean just demo it for yourself and see what I mean.. If you want a really good autopan plugin, that's the one I recommend, and advise you to skip this one completely. (OTOH the chorus by same company, also emulated by Softube, is really nice and lush - that one I can recommend and will do a separate review). I own the Waves Brauer Motion panner and though I don't have any regrets with its quality, I find the Dytronics Cyclosonic panner to be more of a beast. Both are great plugins but the Dytronics sound is uniquely different and I haven't experienced any way to emulate the effect using Brauer Motion. Both accomplish the same panning in the stereo field, but Dytronics definitely does it in a very distinct and unique way. In comparison of CPU, Brauer Motion doesn't tax the processor much; but Dytronics being a UAD plugin obviously doesn't tax my CPU at all. Overall, I am pleased with the investment. It costs more, but my ears tell me it does more and it sounds very different. Great creative fun with all things PAN shaped!!! It's a magical tool for percussions loop! Let your sound travel ! The most efficient panner I know, , including amazing3D possibilities and many more presets of modulation : a big success !!! Many tools can do similar task but this one got some unique character and feel. Absolutely brilliant plugin, albeit simple in some aspects. Add to a rhythm guitar, and it's instant shoegazing. Once again, UA offers world class mixing and sound design tools to the palette. Thank you! A worthy addition for subtle movement and variation. Really nice auto panning plugin. This thing is a must have for sound designers. But as an effect for general mix duties, its a fantastic but non essential tool. It can create a sense of 3D space, which is very reminiscent of certain 80’s tracks and goes from over the top tremolo, and strobe like volume/panning to a mild sense of movement and subtle variation. A really useful way of adding energy to cymbals and hi-hats, but I imagine this thing will be a dream on choppy samples, synth leads and chords. Probably great on Edge like guitars too. You can get similar results with automation, or stock plugins for sure, but this thing has a certain warmth and depth to it that makes it valuable. I can see myself using this with subtly on cymbals/hi-hats pretty frequently. Good job UA! 3D is the key word here!! This makes other very popular panners seem completely B-grade (which I will not name out of politeness). So many possibilities with this thing. Also gives a subtle but interesting character to the sound. It definitely takes a few minutes of fiddling around to properly understand how to set it for your needs, but once you do, it's like a magic stick for motion and psychoacoustics. I love this plugin, and its super creative, and creates a great 3D image for things like hi hats, percussion, and creates movement in the track. It's a really cool, creative effect. I just wish there was a mix knob in the plugin. Other than that, really sweet. I love this one. I put it subtle on the background vocal. Now the lead vocal sounds 3D and alive. Great tool. Not your standard panner. add the color I need in low frequencies, I do not need to do anything else for me.